• Stream Industrial & Engineering (SIE) was established in 1989 as one of Salam International Investment Ltd. subsidiaries. • The name of Salam has been renowned and associated with excellence, achievement, growth and quality. • SIIL continues to benefit from a strong human capital base and corporate culture. These have assured the company’s continued growth and prosperity through capitalizing on its inherent strengths; namely, its staff, expertise, exceptional client care and its continued drive for improvement in all aspects of its operations. 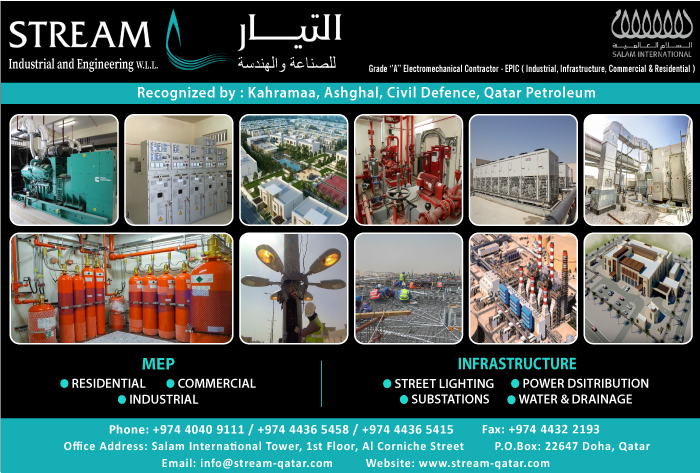 • STREAM undertakes large to medium scale turnkey projects in both the Commercial and Infrastructure sectors. Become the leading contractor to the region’s Infrastructure & Commercial development fueled in diversity resulting to infinite profitable growth. • Enhancing our product portfolio and services in order to provide our valued customers with quality, innovate & competitive solutions. • Continuously improving our procedures and processes to deliver high quality standards. • Empowering our people to become the industry benchmark.